Industry leaders from across the Chinese wine and spirits industry highlighted the role of language and brand awareness in the rise of Chinese wine and spirits sector at a panel discussion held in Hong Kong this week. 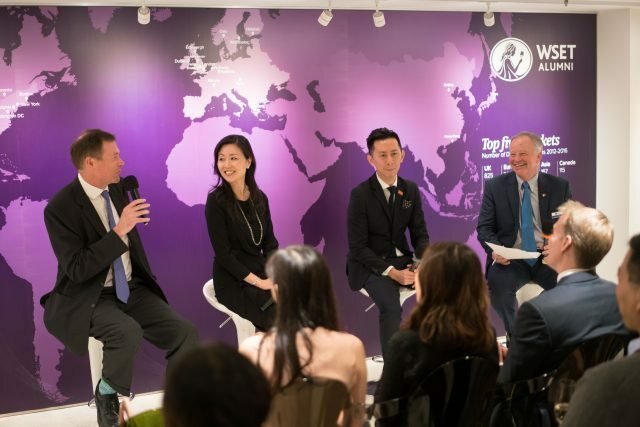 Led by WSET chief executive Ian Harris, the discussion included Jeannie Cho Lee MW, Terry Xu DipWSET, founder of Aroma Republic and Sean Robson DipWSET, merchandising manager of Beers, Wines and Spirits at Wellcome Supermarkets in Hong Kong. As China’s market grows, communication becomes paramount to wine and spirits education. According to figures from WSET, 85% of WSET education in Hong Kong and almost half WSET education across China are in English. This led to the question of whether there is a disconnection between learning about wine in English compared to using the knowledge and operating businesses in Chinese. While the panelists agreed that entry level courses such as L1 and L2 should be offered in local languages in addition to English for wider audience reach, for higher education such as diploma or master of wine, the universal trade language should still remain in English. When it comes to brand names and specific phrasing in local language, translation remains a key hindrance. “Translation is a huge issue and I think the only way to really solve that in my mind is always to have the original name in parenthesis in English next to it if you have any doubt. Wine description is about nuance and about being able to relate in a cultural way and so if you take something literally it actually doesn’t translate so you have to be slightly poetic in the way you translate. Names in Chinese don’t go more than three syllables and yet you have these place names and producers that are 10 characters long because they are translated phonetically and it doesn’t make sense,” commented Jeannie Cho Lee MW, who deals with translation problems everyday in her tasting notes. Speaking about brand awareness, Jeannie Cho Lee MW said, “I think that when you are dealing with people who are not as familiar with wine the most respectful thing that one can do is ask them what style they enjoy or what wine they liked and from that information you try to direct them in a way that’s not confusing.